The Cricket 15 inch Loom is compact and capable, but just a little bigger ( 18.5" w x 18" l x 6" h) than its smaller sibling. At only 5 pounds, it's still easy to take along. The 15 inch weaving width gives you a bit more room to make a greater variety of projects without sacrificing portability. The separate front and back beams allow you to wind on 5-6 yards of warp for longer or multiple projects while still maintaining a usable shed. (Length will vary with yarn and packing material thickness.) 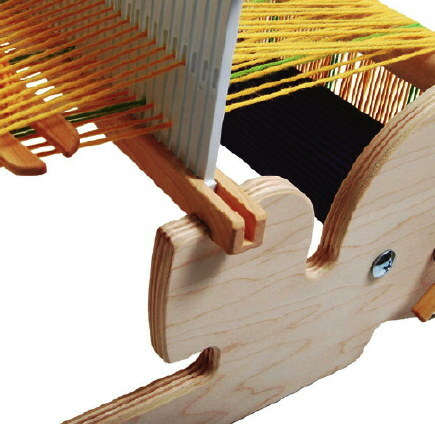 The Cricket 15 inch Loom uses the same reeds as the 15" Flip folding rigid heddle loom. The optional bag is the same one as for the 10" cricket. The 15" Cricket fits in the bag, but extends out the top 4-5 inches. The optional Cricket Floor Stand makes it easier than ever to use your Cricket Loom. It's simple to put your Cricket on the stand and adjust the angle, and it's quick to remove.